Complement any home decor with our bold and colorful patterns. A paper towels strong enough to tackle any household cleaning task, yet stylish for your entertaining needs. Rated 1 out of 5 by TLLHRC from New to Viva I switch to Viva from a more popular brand to save money. However, as one other person commented, "It stinks!" I'm not being mean, it actually has a very bad odor. The most polite description of the smell is that it smells like corn chips. Every time I would tear one to use, I gag. Is this normal? Also, the towels seem to shed. When I move the Paper Towel stand, there's flakes of the paper towel on the counter I need to wipe up. I'm disappointed because I really need to cut my expenses but that smell is not pleasant at all. Rated 5 out of 5 by Trick 1962 from Excellent towels I love the towels,from wiping up a mess to cleaning my glasses. I loved the plaid over the holidays,but I do not like these lime green ones! They match nothing in my home,sorry Viva. Rated 5 out of 5 by EdwardG3 from Multi-surface Cloth for any situation Great product of great quality, the only thing that would stop me from buying it, is the price, discount and bonuses from my regular product. So as long as I get the better deal, I'll buy Viva multi surface cloth. Rated 2 out of 5 by TinaE from Boring Designs Please go back to the old designs. The cafe girls, coffee prints, etc. were fun and brightened up my kitchen. These new geometric lines are just "meh". I like plain for the hard work of cleaning but like something fun as well. Rated 1 out of 5 by JJMG from MORE DESIGNS NEEDED! The quality of Viva paper towels is great and I have purchased them for years. However, the designs are limited to only a few, and in my opinion are very boring right now. I won't purchase a design that isn't uplifting or looks good in my kitchen. I stopped buying Viva paper towels for a few months last year and then I found the limited Mickey Mouse edition at Target, so I stocked up on them. I only have a few left, and unfortunately, once again I have to switch brands because the design right now in stores is not one I'm interested in purchasing. It's very sad! Please bring back some cheerful-uplifting designs. Even the winter snowflake designs were great. 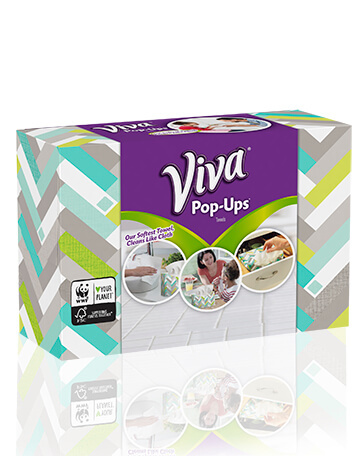 Rated 1 out of 5 by J M K from Viva regular rolls I came to love viva paper towels due to how well they hold up. I have become increasingly frustrated that I can't find a 6 pack or larger of regular sized rolls. Because of this I have ceased buying them completely. I would sincerely like to see VIVa bring back a 6 pack or 8 pack of regular sized rolls single sheets. I do NOT like the "choose a size" rolls at all and no I do not get more out of them I just need to use more sheets. With that as the case I buy a much cheaper brand. Would appreciate feedback from VIVA with a positive response of when they will bring back the larger pack sizes of the regular rolls. I am checking no as to recommending because of this concern. Rated 5 out of 5 by mvenrick from Bring back the signature designs I love viva paper towels however I wish you would bring back the signature designs (cupcakes) etc. Rated 4 out of 5 by Kristine from Great product. Hate the colors I love your paper towels. I won't buy anything else but I am not partial to the colors and designs. I loved the flowers you had. I don't know what happened to them but I can't find them anywhere.